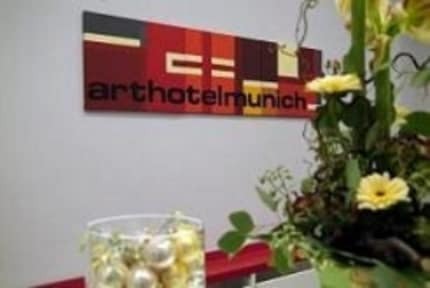 Arthotel Munich i München, Tyskland: Reservér nu! With the nice maintained atmosphere of our house and the support of our complete crew we fulfill every needs of our international guests. Almost all rooms are with own bathroom/WC or shower/WC, radio, television, refrigerator and direct dial telephone except the rooms with shared toilet! The rooms with shared toilet are situated on the basement storeys and equipped with bunk beds! The hotel will be renovating from 25 July 2016 to 28 February 2017. The following areas are affected: Interior and Exterior! Renovation work will only be conducted during business hours on weekdays. Every effort will be made to minimize noise and disturbance!!!!! Please read the room description of the different rooms we offer, so that you know where the different rooms are located and what facilities they have. Check-in and Check-out are in the main building. There is no elevator and no air-conditioning system in the room. CANCELLATION POLICY FOR OKTOBERFEST AND FAIRS (special dates): Cancellation is free of charge up to six weeks (42 days) before arrival date. In case of a late cancellation, late modification or a no show we will charge the first night of your reservation. After you made the booking, we will check, if your credit card is valid. In case the card does not work, we will contact you to provide a new card within 24 hours. In case we will not receive a reply, we reserve the right to cancel your reservation. In that case, deposits are not refundable.